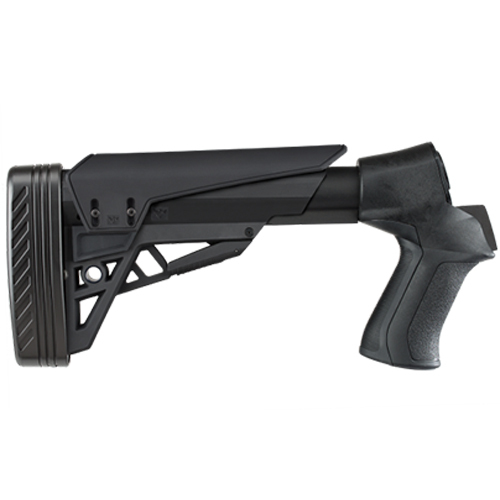 The ATI T3 TactLite Shotgun Stock is an adjustable collapsible stock constructed of weather proof and rugged DuPont Extreme Temperature Glass Reinforced Polymer. ATI's Positive Locking System eliminates movement of the stock on the buffer tube and the need for secondary locking mechanism while providing smooth secure stock adjustments. Extended material in the pistol grip and the 1-1/4" recoil pad work together to reduce recoil and minimize discomfort when shooting larger loads. It has an interchangeable ambidextrous single point sling mount, dual sided QD attachment points and a slot for tactical sling attachment. No modifications of the trigger assembly or specialized tools are required for installation of the ATI T3 TactLite Shotgun Stock. Fits: Mossberg 500/535/590/835 12ga & 20ga (proud fit), Maverick 88 12ga & 20ga (proud fit), Remington 870/887/7400 12ga & 20ga (proud fit), Winchester SXP, FNH USA P-12, Savage Stevens 320 prior to 2016, TriStar Raptor/Cobra, & American Tactical MB3 Pump-Action Shotguns.